A ROUGH conduct charge against Fremantle midfielder Stephanie Cain has been thrown out. Cain was reported in the second quarter of Sunday’s NAB AFL Women’s game at Fremantle Oval for making contact with Adelaide’s Angela Foley. However, no charge was laid, as the Match Review Panel deemed the contact was caused "by circumstances outside the control of Cain", with Foley pushed into the contest towards the ball by another Fremantle player. 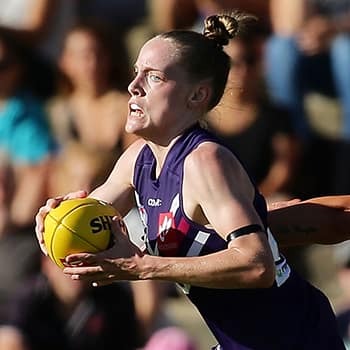 Melbourne’s Elise O’Dea, reported for rough conduct against Carlton’s Sarah Hosking in the last quarter at Casey Fields on Saturday, also escaped a charge. The MRP said her "actions to tackle were not unreasonable in the circumstances". Megan Hunt and Kaitlyn Ashmore (Brisbane Lions) both accepted a reprimand with an early guilty plea. Hunt was deemed to have engaged in rough conduct against Greater Western Sydney captain Amanda Farrugia in the second quarter of Saturday’s game at South Pine, with Ashmore found to have struck Jess Bibby in the third quarter of the same game. The MRP said Ashmore’s strike was careless and low impact. The Western Bulldogs’ Emma Kearney also accepted a reprimand for engaging in rough conduct against Collingwood’s Jess Cameron during the third term of the Saturday night game at Whitten Oval. Kearney’s contact with Cameron was categorised as careless and low impact.